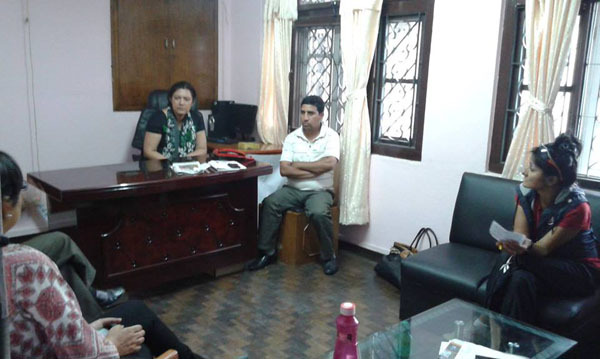 June 14th we meet with my NGO contact Reetu and team – ArunasNepalRelief, Inc.
On June 14th I immediately setup meeting with my contact friend Reetu S B, to assess the needs of the village they had specifically picked in Dhading, one of the many rural places in Nepal. One of many places in Nepal, millions of tourists have enjoyed the beauty of Nepal and homes and hospitality of the Nepali people. These are the places that suffer the most as they are the hardest to reach in the mountains and hills but also the most beautiful places. We discuss how we can help and make a rough draft of list of items they have requested for their school and we can cover with ArunasNepalRelief, Inc. funds and relief supplies. Thanks to team members: Reetu S Baral, Mukesh Kr. Goit, Sefr -ur-Rehmah, Dr. Ayeshna Guruy, Sitaram Bhatteri and Sharjoy Mani Dixit for helping with organizing meeting. We make plans to shop for supplies, organize a big 30 person bus, an open truck and a jeep and crew to accompany my son and myself to Dhading to accomplish our mission to deliver relief supplies directly, hands on. There are many concerns to be discussed and planned out meticulously: treacherous roads, safety, number of hours of travel time, whether its safe to stay overnight, how will we tackle the corrupt few on the way who will stop us once they know immediately we are bringing relief supplies “Rahat”. We discuss and we plan for more meetings. By this end of the meeting, my phone is dead. I hope to get more photos from Reetu. I will post more updates and photos as I have time and the means!